ANN ARBOR, Mich.—Could global warming be contributing to the resurgence of malaria in the East African Highlands? A widely-cited study published a few years ago said no, but new research by an international team that includes University of Michigan theoretical ecologist Mercedes Pascual finds that, while other factors such as drug and pesticide resistance, changing land use patterns and human migration also may play roles, climate change cannot be ruled out. "Our results do not mean that temperature is the only or the main factor driving the increase in malaria, but that it is one of many factors that should be considered," Pascual said. The new study is slated to be published online this week in the Proceedings of the National Academy of Sciences. After being nearly or completely eradicated in many parts of the world, malaria still affects hundreds of millions of people worldwide and has been on the rise in some highland regions and desert fringes. 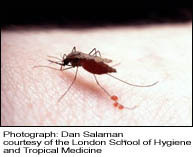 Because the life cycle of the mosquito that transmits malaria and the microorganism that causes the disease are extremely sensitive to changes in temperature, some scientists have speculated that rising average temperatures may be making conditions more favorable for mosquitoes and pathogen development, leading in turn to the surge in malaria cases. But a 2002 study found no significant changes in average temperature in the highlands of East Africa, where malaria has become a serious public health problem, prompting its authors to dismiss the malaria-climate link. Not all scientists were convinced, however, and the topic has been hotly debated over the past four years. Pascual revisited the question, using updated temperature data and improved analysis techniques. The result? "I did find evidence for an increase in temperature, which the authors of the previous paper said was not there," Pascual said. The increase was small—half a degree over the period from 1950 to 2002—but using a mathematical model, Pascual and coworkers showed that even such slight warming could have biological consequences. "We showed that a small increase in temperature can lead to a much larger increase in the abundance of mosquitoes," she said. "And because mosquito abundance is generally quite low in these highland regions, any increase in abundance can be an important factor in transmission of the disease." In the current study, the researchers looked only at the link between temperature and mosquito abundance, not at malaria statistics. In future work, Pascual plans to incorporate malaria data and to explore the interaction of various factors that may affect the spread of malaria. "I think it's reasonable to assume that these factors are not independent," Pascual said. "It's important to understand how they interact and also to see if we can determine their relative importance. This is a very polarized field, in terms of supporting or not supporting the role of climate versus other factors. We don't want to contribute to the polarization, which I think is very unproductive in terms of the science. I hope we can move from this sort of debate into a more constructive one about interactions and relative roles of all the factors that may be contributing to the resurgence of malaria." Pascual collaborated on the research with Jorge Ahumada of the University of Hawaii, U-M graduate student Luis Chaves, Xavier Rodo of the University of Barcelona and Menno Bouma of the London School of Hygiene and Tropical Medicine. The research originated at a working group on Global Change and Infectious Disease at the National Center for Ecological Analysis and Synthesis (Santa Barbara, Calif.), a center supported by the National Science Foundation and the University of Santa Barbara, and additional support was provided by the National Institutes of Health, the National Oceanic & Atmospheric Administration and the James S. McDonnell Foundation in Global and Complex Systems.